Flight reservations must be made in advance and you may reserve a date with a credit card number. If your flight is canceled due to unfavorable weather conditions, we will reschedule your flight for the next available date. Dressing in layers appropriate for the season is recommended. Tennis shoes and long pants are most commonly worn, as you will be able to share in the excitement of unfurling and inflating the balloon, if you wish. SkyScapes of America, LLC requires 5 days prior notice of cancellation and/or rescheduling prior to a scheduled flight without penalty. If passengers fail to check in the day before their scheduled flight, the reservation may be cancelled and $100/person charge may be incurred. If a passenger does not show up for their scheduled flight, the full amount is forfeited. Feel free to bring cameras and a bottled drink (no glass) on your flight. However, we don't recommend keeping a video camera to your eye the entire flight - you might miss the experience! Your flight of fantasy will take place just after sunrise, the most tranquil time of day. Passengers are required to call our office the day before their scheduled flight to check in and discuss current weather conditions and meeting time. All passengers are met at the Anderson Sports and Entertainment Center launch field, located on Woodcrest Road. To enter the launch field, go through the black gate on Balloon Lane and drive to the top of the hill. Your unforgettable flight begins here! You will be in the air approximately one hour, after which the balloon is packed away and adult passengers are then treated to a traditional champagne celebration! If there are children flying, we also carry orange juice and nonalcoholic sparkling juice. So that you may plan the rest of your day, this hot air balloon excursion will take about 3 hours, one hour being in flight. The cost starts at $200.00 per adult and adult-sized children. Children 10 and under are $100.00. 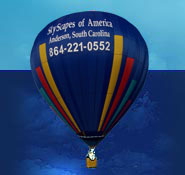 Our balloons can carry 4 to 6 passengers, depending on weight. So, please don't be offended if you call our office and we ask for your weight! We cannot fly just one passenger, and if two people are booked for a specific flight, it is very possible we will book another couple. If you simply must have a private flight, we may be able to accommodate you, as long as no one else has booked the same day, however, the cost would be $600.00 for a couple. Please contact our office for further details regarding small children and the elderly. You have had any surgeries performed. Unless it has been more than one year. You have had any recent injuries to limbs or back. If any questions, please discuss this with our office. © Copyright 2007 SkyScapes of America. all rights reserved.